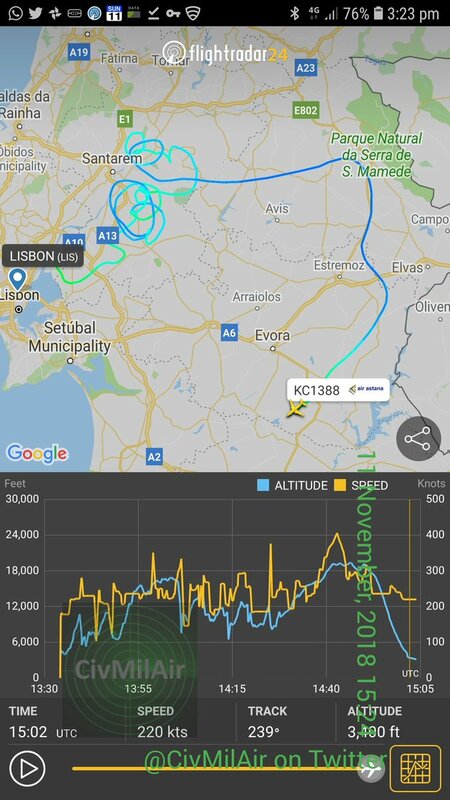 An Air Astana #KC1388 plane with six crew on board declared an emergency over Portugal on Sunday after experiencing serious flight control problems. The Embraer 190 (reg. P4-KCJ) was in Portugal for maintenance work (a C-check) and took off around 14.30 UTC from an airfield at Alverca, about 30 kilometres (18 miles) northwest of the capital Lisbon. Air Astana #KC1388 declared an emergency general emergency after reporting flight control problems to Air Traffic Control. Two Portuguese Air Force F-16s were scrambled to accompany the plane while authorities initially evaluated how to handle the emergency. According to ATC, during the first 30 minutes of the flight pilots attempted to reach the sea for a ditching. At 15.26 UTC the aircraft safety landed at the airport of Beja air base, about 180 kilometres (90 miles) southeast of Lisbon. Hacking BEZOS' Phone From Mecca During The Hajj 2018......LOL! Space Fantasy #74: Is This What Human Colonies Will Look Like On Mars? Airport DOOM! Kuwait Airport Floods! Holy See Addresses UN On OUTER SPACE!